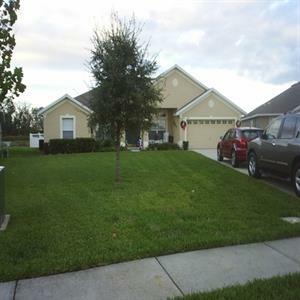 Nice 4 bedroom 2 bathroom Lake Mary house in sought after neighborhood being close to nearly everything. House has a formal living and dining room, family room with open concept to upgraded kitchen. Split floor plan with master on one side and the other bedrooms on the other side. Backs up to conservation area with screened patio overlooking the private back yard. I-4, Lake Mary Boulevard, Altamonte Mall and Seminole Town Center Mall all within close driving distance. 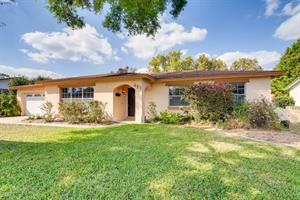 4 bedroom pool home located in a very desirable area of Lake Mary. 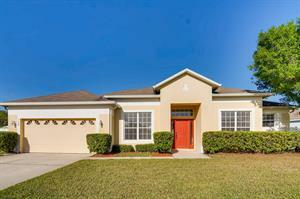 This home is close to the many shopping and dining options that Seminole County has to offer. The home features 4 bedrooms and 2 full baths, formal living and dining area, and a large open kitchen great for entertaining. There is a fireplace, custom upgrades, and much more. This beautiful 4-Bedroom, 2-Bathroom home is situated in the Carriage Hill and is just a short walk or bike ride to the Seminole Trail. The home also features a fully fenced backyard!! This luxury home features a granite breakfast bar, huge center island, wood cabinets, interactive home system, and a large lanai. The home also features a downstairs master & sitting area, a master bath with dual walk-in closets, garden tub, separate tiled shower, and his & hers vanities. The 1st Floor office has a full bath and could also function as a downstairs second suite. The 2nd floor contains a large bonus room, 4-Bedrooms, and 'jack and Jill' bathrooms. This gorgeous home is a short walk to a community boat ramp and the community amenities such as a community pool, dock, park and playground and is walking distance to the new Independence Elementary! Situated in the beautiful Almond Tree Estates community, this recently updated pool home is nearly 2,500-square feet, with 4-Bedrooms and 3-FULL Bathrooms. The home also features a fully screened pool which is perfect for entertaining. The Family Room is lined with gorgeous hardwood floors, and a wood-burning fireplace. The Gourmet Kitchen features granite countertops, a backsplash, and tile floors. The Master suite opens to pool/lanai, double closets & spa bathroom offers soaking tub, tile shower & his & hers sinks. 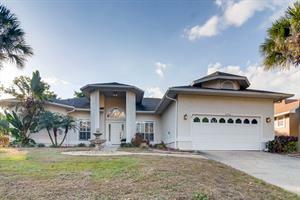 This beautiful home is situated in Independence and features a community accessed boat dock on Lake Hancock! This carriage house (main house 2,974 sq.ft. & apartment is 462 sq.ft.) offers plenty of space. 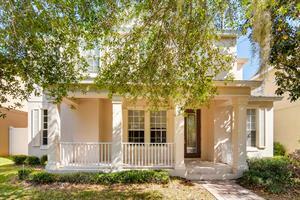 The front porch and foyer include upgraded tile entry & soaring ceilings. The home has wood flooring in the separate formal rooms & family room and the updated kitchen features new cabinets, GE S/S appliances & modern granite counters. The family room offers access to an extensive partially covered brick patio. The 2nd level features a Master Suite, open air loft, and a laundry room. There is full size guest suite with private bath and the corner master suite features an upgraded Master Bath with his & hers vanities, granite, corner garden bath & large shower with upgraded tile. Access to community bike paths, community center, athletic areas & community pool Independence is centrally located nearby and the strategic location offers access to the 429, Turnpike & 408 & Disney World. Situated in the gated community of Springlake Village, this beautiful home features vaulted ceilings over a formal dining room with large windows allowing plenty of natural light. The spacious open floor plan sees a large kitchen and breakfast which separates it from the family room. There is a fully screened lanai featuring a summer kitchen with stacked stone, a granite counter and a gas grill with a mini fridge perfect for entertaining. The floor plan is split and features (2)-Bedrooms, a full Guest Bathroom and a Master Bedroom on the other. The master bath is large with ï¿½? ?His & Herï¿½?? dual sinks and closets, a separate shower and large bathtub. This Beautiful 5-Bedroom, 3-Bathroom 2-Story home is situated in the gated community of Johns Landing w/private access to the chain of lakes. The home opens to a grand staircase with wood floors & banister, with wood floors in the dining room and office as well as tile floors throughout the rest of the 1st-Floor, with the exception of the Bottom-Master Bedroom as it features comfortable carpeting. The Master Bathroom features ï¿½? ?His & Hersï¿½?? sinks and a garden tub with separate shower. The kitchen opens up to a naturally lit Family Room w/vaulted ceilings and sliding glass doors which lead you out to the covered patio. The 2nd level features carpet throughout. 4 bedroom 2 bath home complete with a 2 car garage. This home has a beautiful water view that can be enjoyed from the covered screened patio. Many upgrades throughout this split floor plan home that is centrally located near schools, shops, and restaurants.